Oscar winning actress Emma Thompson compared fracking companies to a desperate Looney Tunes character as she visited a drill site in Lancashire. She was at the Preston New Road site near Little Plumpton, a place she last visited in April 2016 for a Greenpeace bake-off stunt on a field near where Cuadrilla's drilling rig now stands, and where she and her sister Sophie were almost covered in manure from an angry tractor driver. Scores of women dressed in white to symbolise peace welcomed the actress to the gates of the site and police had to enforce a contraflow system with passing vehicles for safety reasons. The actress spoke to the crowd, who had marched to the site, and told of her admiration and support for their campaign. 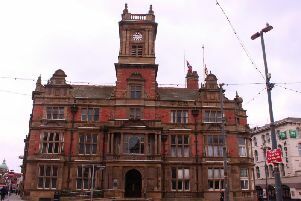 In an interview with the Blackpool Gazette she said that she believed the tide was turning against fracking nationally as opposition in areas near potential drill sites hardened. She said: "I am here to stand with the anti-fracking community in Lancashire and more widely in all the places where people and local communities have said a very clear no to fracking but have been completely ignored by our so-called democratic Government. "They have gone over people's heads and granted contracts to companies who are beginning to look more and more like Wile E Coyote running out of road, leaving just holes and empty promises. "I am also here to stand with them and to remind myself that these local actions are hugely important and have an impact, but they are also global actions because everything that a local community does to safeguard the climate is an action taken on behalf of the whole planet. "It's just as much global as it is local, because climate change we know now, is the most serious threat to mankind as Stephen Hawking, God rest him, has said so very recently." Asked what her impression of the site are now two years on from her last visit before construction work had begun, she said: "There's a bloody great drill doing nothing in a beautiful green field where I was once sprayed with dung by an irate farmer." She expressed admiration for the campaign which had often been spearheaded by local women such as the Lancashire Nanas group. "When somebody turns out for something like this, it is no small thing. A lot of these women are coming away from children or ageing parents who need them because they are in the position of care giving, to come to do a peaceful protest giving up time and energy. "It's so humbling and inspiring when they do that because a lot of the time people say, 'What can I do, I am helpless' especially when the Government ignores them. "But look at what can be done. For seven years the Nanas have been protesting and there's still no real movement from Cuadrilla and indeed Third Energy who have pulled out in Yorkshire. I really do think that what this is achieving is a sea change. "Council after council have been rejecting fracking, and projects have been delayed. The future of this industry is so uncertain ministers have all but stopped talking about it. Fracking is a dud - it's time to move on. "Ministers should stop wasting time and energy imposing fracking and its imaginary benefits on local communities and focus instead on the real jobs and investment clean energy sources like offshore wind can create." Shale gas exploration company Cuadrilla has been at the site since January 2017 and is poised to drill horizontally in deep lying shale rock prior to test fracking to see if natural gas can be recovered commercially. It is set to contest a planning inquiry starting on April 10 to gain permission to drill at a second site on the Fylde, at Roseacre Wood. Lancashire County Council refused permission. The company is to hold its fifth instalment of its public webcast tour and live stream sessions at the Preston New Road site on Friday from 2pm to 3pm with an update on the first UK horizontal well being drilled in shale. Gillian Wood from Blackpool Greenpeace said she was delighted to welcome Emma Thompson to the area. She said: "Its fantastic we need that support and it brings it to a wider audience. She is really passionate about Greenpeace and the environment." She said the event was positive and peaceful: "It was really good fun, lots of singing and lots of cake. The women wear white on these regular gatherings as a mark of peacefulness and calm, because there are a lot of police down at the site and it can get quite scary sometimes."